Global business – local benefits – we know how to do it - WSSE "INVEST-PARK". Wałbrzyska Specjalna Strefa Ekonomiczna "INVEST-PARK". Can the global business help in the development of small local companies? 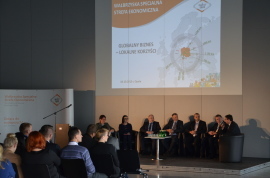 The participants of the discussion panel organized by the Wałbrzych Special Economic Zone “INVEST-PARK” as part of the 5th National Food Congress concurred that this symbiosis can be mutually beneficial. 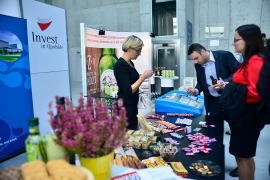 The 5th National Food Congress was held in the Exhibition and Congress Center in Opole on 6 October. The choice of the venue for this event, which can already boast a well-established tradition, was no accident. The farm and food industry in Opole and Opolskie Province enjoys not only favorable geographical conditions (long, sun-warmed vegetation period), but also economic ones, as evidenced by the most recent investments – the construction of Pasta Food Company’s facility for the production of frozen lasagna, the expansion of the existing plant owned by Nutricia, which belongs to the Danone corporation and makes infant formula, or the construction of a new production line in Mondelez’s Chocolate Factory in Skarbimierz. “The food industry already accounts for 13% of the Polish GDP. The Wałbrzych Special Economic Zone is mostly about the car industry, but the share of food companies is becoming increasingly significant. There are already 13 of them, and they are major players. Supplementary industries, such as packaging and logistics, are also quickly growing,” said Barbara Kaśnikowska, President of the Wałbrzych Special Economic Zone. Mrs. Kaśnikowska was also the moderator of the discussion panel “Global business – local benefits – we know how to do it”, organized by the WSEZ and held as part of the Food Congress. What attracts investors to Poland is the proximity of other markets, the German one in particular, and the growth forecasts for the domestic market. It is especially important for food companies, which can rarely rely solely on exports. Adam Małecki, Deputy Director of the Foreign Investment Department of the Polish Information and Foreign Investment Agency, quoted analyses demonstrating that the most important factors which are taken into account by investors when deciding where to locate a facility are the transport infrastructure, situation within a special economic zone, and the proximity of suppliers and buyers. Unfortunately, Polish suppliers of products for the food industry are not always able to meet the expected quality standards, which are often extremely high. These standards are imposed by retail chains, and subsequently required by the producers when dealing with suppliers. One of the questions raised during the discussion panel concerned the impact of global corporations on the development of local entrepreneurs’ firms. The discussants agreed that large companies help local firms to grow and be more competitive. “In the long run, it is an opportunity for small firms because it increases their competitiveness and innovativeness. Local enterprises will then be better prepared to break into domestic and foreign markets,” said Roland Wrzeciono, Director of the Opole Center for Economic Development. “We have been cooperating with small firms for many years. In general, our sales to them have been growing,” said Herbert Hyb, Director of the DS Smith plant in Oława. Large corporations compete with each other and focus on increasing their share in global markets. However, they are not omnipotent. They cannot focus on the entire production process, and they need to assign some of the tasks to smaller suppliers. “I see no conflict here, only mutual benefits. We have been cooperating for quite a long time, and as a result our supplier base has grown,” said Roman Sitko of Mondelez. Almost 400 people participated in the congress. It provided small enterprises with an opportunity to meet large companies functioning in Opolskie Province, such as Animex, Pasta Food Company or Nutricia, which presented their purchasing needs. There were also several seminars devoted to special subjects, including today’s poultry industry, company growth strategies, or exporting to the UK. 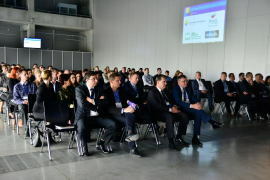 As part of the Congress, the Opole Center for Economic Development organized the 1st Opole Forum of the Farm and Food Industry Poland – Belarus, Kazakhstan, Russia, Armenia. 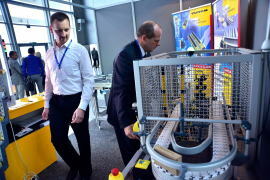 The 5th National Food Congress was organized by: the City of Opole, the Exhibition and Congress Center in Opole, the Opole Center for Economic Development, and the Wałbrzych Special Economic Zone “INVEST-PARK”.